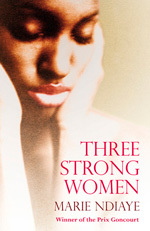 Three Strong Women concerns the lives of three women of Senegalese descent, each of whom faces a personal crisis. The stories are set in modern day Senegal or in France, the former colonizer of that West African country, and each woman has a thin and tenuous link to another woman in a different portion of the book. In the first unnamed story, Norah, a lawyer with a successful practice but a troubled home life in Paris, is called back to Senegal by her father, a powerful man who treated her with disdain throughout her childhood. Upon her arrival she learns that her brother, who had been taken away from Norah and her mother by her father, is in serious trouble and needs legal representation. Norah learns more about her brother's crime, her father's life and mysterious downfall, and her Parisian lover's suffocating influence on her and her daughter. However, the unfolding of these interconnected lives causes her to become progressively more unraveled, as reality and fantasy become mixed in her mind, which makes for an intriguing and dizzying tale. The middle story is the longest of the three, and its female protagonist, a Senegalese teacher named Fanta, appears only as a peripheral character. Rudy, Fanta's husband, is a Frenchman; they met at the lycée where they both taught in the Senegalese capital of Dakar. After he is forced to resign, he takes Fanta and their young son to his home town in France, with the assurance that she will be permitted to teach there and that he will find steady employment as a university professor. Neither promise is kept, and the two become trapped in a loveless marriage filled with deceit, mistrust and frequent verbal bouts. The events in this story take place on one remarkable day, when Rudy deeply wounds Fanta and engages in increasingly more erratic behavior at work, at the school his son attends, and at his mother's house, while the reader looks on with dread. In the last story, a young Senegalese widow who makes a brief appearance as a servant in the home of Norah's father is expelled by her late husband's family, and is instructed to find her cousin-in-law Fanta in France. She is placed in the care of an unknown man, and is forced to decide whether to board a dangerously unstable vessel on an Atlantic voyage, or attempt to cross the North African desert by foot to reach her ultimate destination. Each story ends without a clear resolution, and I felt as if I were awakening from three separate captivating dreams that hadn't ended yet. Elements of magical realism are occasionally infused into the narrative, such as the buzzard hell bent on revenge in the second story. Three Strong Women is a valuable and unique addition to the immigrant experience, a powerful work of literature that left me desiring to know more about the main characters. It was originally published as Trois femmes puissantes in 2009, and it won the prestigious Prix Goncourt that year, marking the first time that a Frenchwoman of African descent had received this honor. Marie NDiaye is a rising star in her home country, and one hopes that this novel will gain her fans in the English speaking world as well.